Look Who Showed up at my house! Look who showed up at my house today, none other than Jim Lorenz, my Pop. I have not seen him in 2 years, he lives almost 1500 miles north east of here. I am glad I was home, it was completely unexpected. He had driven with my older sister, whom I have no idea when the last time I saw her was, from L.A. where she was living. She is moving to Chicago and they decided to pass through. 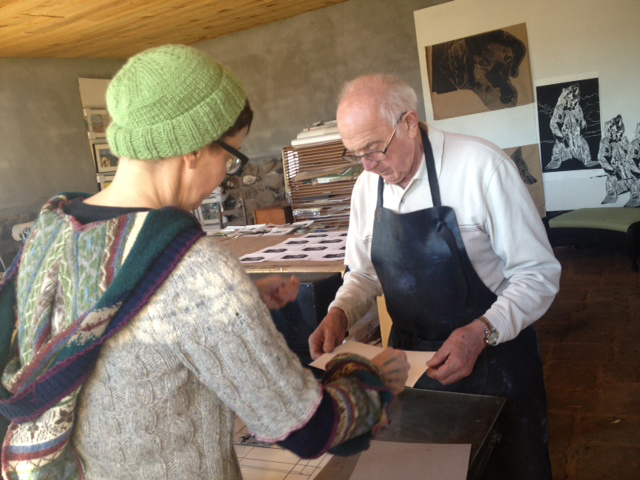 I gave Melissa and my Pop a quick printmaking demo. 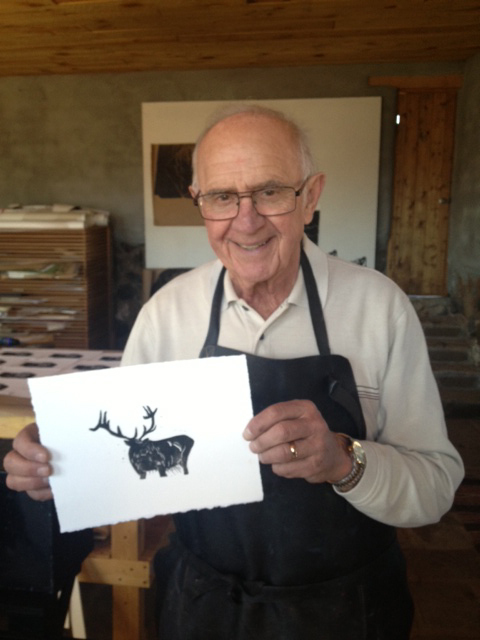 He chose to print an Elk. I let him wear my handmade Italian leather apron. 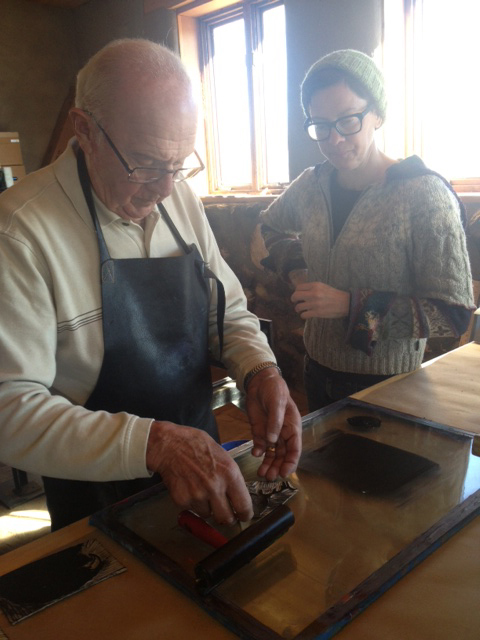 He quickly learned to lay out the ink and use the brayer to ink up the plate. 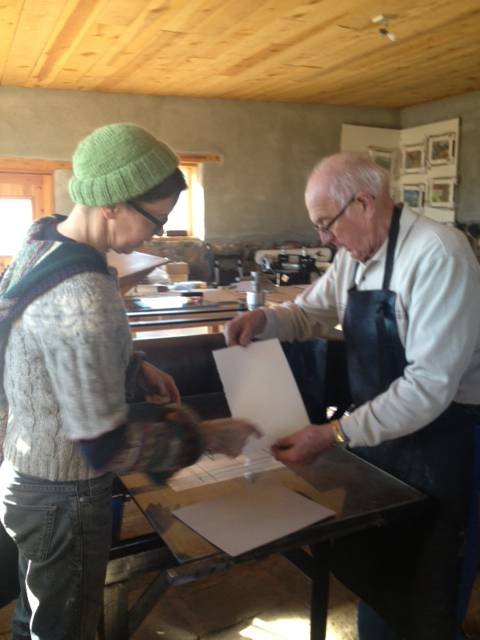 After putting the plate on the press bed, he put down the paper and then the cover board. The behold, a new Elk print! He made three and took them with him. I could see he got a huge kick out of it, so did I. You can see he is pleased in the top photo. They only stayed a couple hours, but we did get in a walk at Plaza Blanca and lunch at Bodes. I had already pulled today’s print before they got to my house. I would say, it was a pretty darn good day! That’s great that you had some surprise family time. It is very hard to be so far away from family. It is something I try not to dwell on. Looks like talent for printing runs in your family. Hil, we had a GREAT day! It was wonderful to be there and spend time with you. Your place and your studio are incredible!